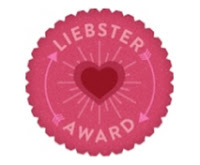 There is something in the blogging community called Liebster Awards, and in the past few weeks I have been nominated for two! There are designed to promote socializing on blogs which I am often neglectful of. Because I recieved two awards and because I am bad at socializing, I am abandoning the rules and just going to answer the questions my fellow bloggers put forth to me. Always a rebel. Here are the questions from Just a Mum?, followed by my answers. 1. If you could learn any one skill overnight, what would it be and why? I would love to just know how to play guitar. I have tried to learn a few times, but am too impatient and have a really hard time moving my fingers to change chords. I am even bad at it while playing Rock Band. 2. What music do you listen to when you're feeling down? Sad music for sure. The words are clearer and more meaningful, the notes are felt more deeply, I get my sad out. My favourties for those types of days are Alanis Morrisette, David Gray, and Ben Folds. 3. When's the last time you were stupid happy? Probably the last time I had Spicy Tuna Rolls - so New Year's Day. 4. If I gave you a t-shirt with a picture of bacon on it, would you wear it? Yes I would. I like both free stuff and bacon. 5. In your opinion, what is the perfect food? In general it is tacos. On special occasions it is sushi. 6. Go to a party, or stay home with a book? I would probably go to the party, but if I was halfway through an exciting book, I might keep reading when I got home (even if it was super late). 7. Who would you most like to be trapped in an elevator with? Because I am currently watching Justified, I would have to say U.S. Marshal Raylan Givens. 8. Do you watch the news? Why, or why not? No, I actually hate the news. When really bad events happen I don't even go to Facebook because my newsfeed is full of real news. The news is generally negative and promotes a lot of fear. I don't need that in my life. 9. Servers start singing Happy Birthday to you at a restaurant: Do you cringe and endure, or sing along? I probably do a little 'sitting a the table' dance. And turn bright red. 10. Name a singer/song that you're embarrassed to admit you love. I'm trying to think of one but I'm pretty proud of all my music choices. Even the bad stuff, I'd happily admit to loving. 11. If you could be doing anything right now, what would it be? Watching more Justified while eating a double order of Spicy Tuna Rolls. Here are the questions from Awesomesauce & Other Experiments, followed by my answers. 1. Vanilla ice cream: a cop out instead of getting real ice cream flavours or truly fantastic on its own? Truly fantastic on its own (reminds me of my Nanny), though I would never pick it first. 2. Are you one of those people who can only wear black socks, or do your feet get to have some fun colours and patterns? I generally wear grey socks, but there was a time in my life I had a cool sock source and wore a lot of fun colours, patterns, and lengths (even knee highs!). 3. What is your preferred method of caffeination? Coffee in the morning. Tea in the afternoon. 4. If you had to choose a domesticated animal as a house pet and could not choose a dog or a cat, what would you pick? Bunny rabbit. 5. What do you want science to create in an easily commercially available way first: teleportation a la Star Trek or hover skateboards a la Back to the Future? Teleportation is a must! 6. Unicorns or centaurs? Unicorns! 7. Favourite food that tastes like purple? Blueberry muffins from a mix, where there is no real blueberry at all. I love that flavour. 8. Which do you believe is the better movie trilogy: original Star Wars (pre-Lucas mucking things about) or Lord of the Rings? Lord of the Rings (extended even! ), but I do have a fondness for Star Wars as well. 9. What is your favourite childhood song (eg. Down by the Bay, The Cat Came Back, etc)? Down by the Bay is pretty classic. 10. What do you usually have for breakfast? Steel cut oats mixed with cinnamon, 1 tbs dried cranberries, and 2 tbs chopped walnuts. 11. Pancakes or French toast? Pancakes. I have always viewed french toast as a waste of milk and eggs. That was fun to read. Thanks for sharing everything with us. I haven't had a spicy tuna roll in FOREVER. Lol - I'm going to have to try harder with my questions next time... I was just reading the last time I tagged you, and some of the questions were exactly the same!